← Framework #39: Best Book Ever – Question and Answer Session: Anything Goes! Praise God as this last weekend of DNOW was a huge success! God used Jed in a huge way to teach our students how to live in today’s culture for the glory of Christ! God used the band in a huge way for our worship of Christ! God used our mission projects in a huge way to bless others for the name of Christ! And God used our small groups in a huge way for our students to grow closer together in Christ! This Wednesday night, we’re going to kick-off a brand new series on the book of Proverbs called “GET SMART.” This series will be all about how to get, grow in, and use godly wisdom in our daily lives to look more like Jesus. Students, be praying, inviting, and bringing your friends to the encounter we get with God every Wednesday! NETMA is attached for your viewing pleasure. Be sure to check out the Reading Plan for this week. This Wednesday, will begin a new series on the Book of Proverbs called “GET SMART.” We’re putting together videos, we’re building a new stage-set, and we’re studying like crazy to make this series everything God wants it to be to see student’s lives changed for Christ! This Sunday, we will all meet in the student building at 9:15am for announcements and then we’ll all go to our designated small group rooms for fun, fellowship, and discussion on what God has done in our lives the past week through the daily reading of His Word and from the teaching on Wednesday night. SMT’s are back in full-force this Sunday night, so make sure to check with your SMT leader for your meeting times, places, projects, and needs as we serve Christ together with our spiritual giftendness in His church! Saturday November 20: CBSM BonFire Fest. We’ll meet up at the CBSM student building around 5pm. We’ll all walk together to a secret place to eat some seriously good fall foods and play some old-school games, then we’ll walk over to a ginormous bonfire with even more awesome food, fun, and just sweet as all get-out fellowship together. All your friends are invited! Don’t miss this! Wednesday, December 15th: CBSM Christmas Partay. We’ll meet up at the CBSM student building by 6:30pm to go over some Christmas carols, and then we’ll hit up all the neighborhoods and houses surrounding our church for a local-mission trip by canvassing the near-by community with Christmas carols all about Christ! Then we’ll meet back up in the FLC (Gym) for some good-ole Christmas grub, and a Christmas game where you’ll go home with a Christmas gift. All your friends are invited. Don’t miss it! January 14-17: CBSM SKI TRIP 2011. Reserve this date on your calendar as we’ll be going to SUGAR MOUNTAIN in Boone, North Carolina to ski it up! Registration is now closed. If you’re going…your remaining balance of $250 is due BY Wednesday, December 8. And our mandatory Ski Trip meeting for everyone going is Sunday, December 5. The full $350 cost includes two days of skiing, basic/necessary rentals, lift tickets, transportation, all meals once in NC, and your official CBSM Ski Trip tshirt. Students will need to pay for 2 meals going up and 2 meals coming home. We will have small group Bible studies at night. 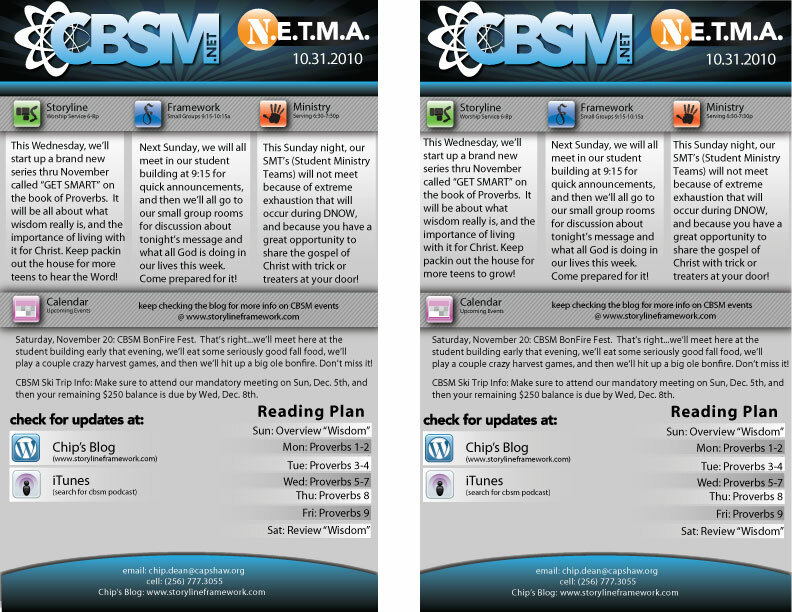 BLOG: Check out our blog (www.storylineframework.com) to hear past messages, to watch several weekly videos, to read Chip’s weekly thoughts, etc. You can subscribe to the blog once you’re on there by entering in your email address to the subscription bar on the right side of the page. You can also check out our brand spanking new feature…watching our sermons on video! Our test sermon is on the blog so just go there, scroll down, and press play to check it out. TXT MSG: If you want to receive pastor Chip’s CBSM Text Msgs, then just text him your first and last name @ (256) 777-3055…and you’ll hear from him regularly with CBSM announcements. FACEBOOK: Make sure to join our CBSM Facebook Page by simply searching “CBSM Facebook” in your facebook search bar.